Several weeks ago Stephanie Dibb Sorenson, who blogs at Diapers and Divinity, asked me if I would be interested in reading and reviewing her new book, "Covenant Motherhood." I knew that she had been working on it for awhile and was excited to see the final product. The premise of her book is that motherhood, in all its many facets, is symbolic of Jesus Christ. Mother's through the work they do-- creating, teaching, succoring, providing, cleaning, defending, loving, forgiving, and saving-- are mirrors of the Savior and His mission on the earth. I really enjoyed reading all of Stephanie's insights into how motherhood parallels the Saviors ministry and His atonement. I think that her book would be a big eye opener for mothers who are struggling to find purpose behind what they are doing. I think that many of us got into the mothering job because we want to be obedient to the instructions the Lord had given us, but like Adam, may not really understand the full magnitude of what we are engaged in. I know that reading this book has helped me be approach several aspects of my mothering-- especially my housework and chores-- with more spiritual eyes... which is good because I need all the help I can get on that front! I thought that was such a beautiful thought and wish that more women understood this; that creation is part of what it means to be a woman. Our Heavenly Mother is a creator, in the grandest sense of the word, and what we do as women here on the earth mirrors her eternal nature. Like Stephanie said, it is more than childbearing, it is creating and shaping souls. The most beautiful thing is that you don't have to have children of your own to be a creator. Each and every woman is a MOTHER-- a CREATOR-- it is part of her divine nature. 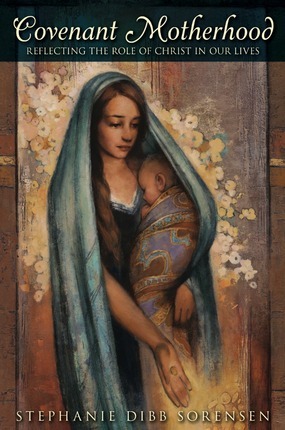 Covenant Motherhood is now for sale, just in time for Mother's Day. You can buy it online and in LDS Bookstores! Thank you for sharing this review. I am looking forward to reading the book. I love the beautiful thoughts you have shared from her book. The artwork on the front is exquisite. Love these insights you share, Heather. Makes me want to go and read this book RIGHT NOW! You and Stephanie have opened my eyes to symbolism I never saw.